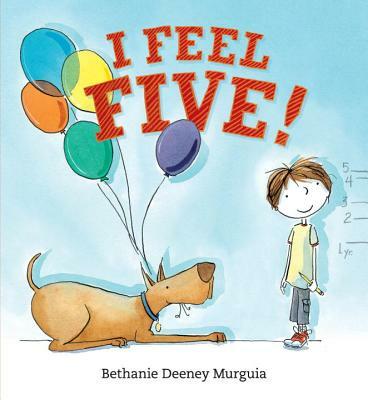 What is turning five supposed to feel like, anyway? A charming look at growing older, from a child’s point of view. Fritz can’t wait to turn five! His birthday starts off well when he eats all five of his birthday pancakes and gets brand-new sneakers that fit perfectly. But when he peeks in the mirror, everything looks the same. And his teeth won’t wiggle — not a single one. Even after he gets to wear the birthday crown and everyone sings to him at school, five still feels an awful lot like four did. Will Fritz ever feel five? In this sweet picture book that’s perfect for children of any age, Bethanie Deeney Murguia explores how it feels to grow up. Bethanie Deeney Murguia has worked as an art director for publishers, design firms, and marketing agencies. In that time she has had many birthdays, but still feels five when she wears her birthday crown. Her daughter, who had many expectations about her fifth birthday, was disappointed when she “didn’t feel five” on her big day. This inspired Bethanie to write a story about the quieter, unexpected moments that help us to realize we’ve grown or changed. She lives in San Francisco. This ... beautifully told story should prompt intriguing conversations on how events like birthdays infuse meaning into the flow of days that makes up our lives—even when any actual day-to-day change is barely evident. Fritz and his Marmaduke-size dog make excellent companions on this philosophical journey, leavening big questions with kid-scaled humor. Murguia has perfectly captured the child perspective here, and Fritz’s trials and tribulations will be easily recognizable to young listeners. The idea that the feeling of five comes not with a quiet reflection but with an action is convincing and effective, and the independent apple-picking is a tidy callback to the opening spread, where Fritz’s father must lift him up to grab apples from a fruit-filled tree. The line and watercolor illustrations pair tidy linework with muted, somewhat autumnal palette, awash with dusty reds, pale yellows, and washed-out blues in airy compositions; gently varied compositions add rhythm, and spare drafts- manship is still plenty accessible as Fritz works through his problem. Those who, like Fritz, feel five (or thereabouts) will greatly appreciate this birthday tale. Self-assured pen, ink and watercolor illustrations produce vivid renderings of a young boy’s bounce, his tousled hair, bony ankles, fluttering superhero cape, inflated birthday expectation and subsequent deflation. Fritz’s day plays out in soft watercolor scenes that make fine use of page turns, page composition and supremely crisp white space. ... Every child knows how it feels to squirm gleefully in the throes of a big buildup and also how it feels to stifle tears after a big letdown, making Fritz’s story universally appealing. Empathetic and sweet, this simply told, well-illustrated book helps not only with birthday bummers, but with negotiating many of life’s highs and lows. Lively artwork rendered in pen and ink and watercolor enhances the simple lines used for facial features. Murguia employs excellent pacing by using a varied perspective, such as the anticipation created during the pause in the narrative with a view of two pairs of shoes meeting on the playground—one pair of reddish-orange sneakers and another pair of red flowery pumps. The book ends on an up note, with Fritz looking forward to additional developments, including maybe a loose tooth. The lively, cartoonlike watercolor-and-ink illustrations help move the action along and enhance the overall happy, optimistic mood. The appealing illustrations for this charming look at growing up were done with pen, ink and watercolor.